It was the fattest pigeon I have ever seen. It eyed a six foot bird feeder with the zeal of a professional steeplejack. And then, improbably, the huge ungainly bird opened its wings and began, tortuously, to waft the air in its vicinity. The little pigeon wings do not grow in size to compensate for portly pigeons. They lifted this great pudding of an overfed bird into a kind of juddering flight, veering crazily this way and that in the manner of a sozzled louche dandy on his way home in the early hours of a London morning. He rose inexorably higher, a triumph of willpower over basic physics, until he reached the bar by the hole where the seeds could be had. We knew that pole could no more take this pigeon’s weight than a cocktail stick support an entire grapefruit. And we watched as, slowly, the seed feeder pole, previously stood at a proud 90 degree angle to the ground, six feet tall, began to list dangerously. The other birds took one look and shot off. But the pigeon sat there, taking the air, considering his next outsize move. The pole came to rest at 45 degrees to the ground as we sat and watched through the glass of the restaurant, crying tears of mirth. As we got up from the table to leave he was still sitting there. It is incidents such as this which have convinced us all that the pigeon is not the brightest fairy light in the string. It is common as muck. Google pigeon distribution and you will find they are basically everywhere. Everywhere except the Sahara Desert and the Arctic. And yet today, we hear, a pigeon’s valiant deeds are being trumpeted, and its message rushed straight to code-cracking experts at the brain-drain to rule them all, Bletchley Park. The news story broke yesterday: Dave Martin was renovating his Surrey chimney when pigeon bones began, one by one, to drop down. And finally, down dropped an unceremonious pigeon leg with a small red canister attached to it. It has been confirmed to be a World War II message, in code, destined for Bletchley Park, the UK’s National Codes and Cipher Centre. The heroic pigeon in question had almost made it home before it got a got confused and fell down a chimney. No one seems to be mourning the pigeon. They have honoured three of the War’s greatest pigeon heroes by stuffing them and standing them up in the Imperial War Museum North for tourists to gawp at. The sight of the forlorn little leg with a message which never got there: it made me think. Such a very simple creature, carrying messages from complex minds. How do these birds keep such exalted company? The pigeon has one overriding strength: it knows how to go home. It knows this not because of a high IQ, but because it has a nerve in its beak which can detect magnetic fields. 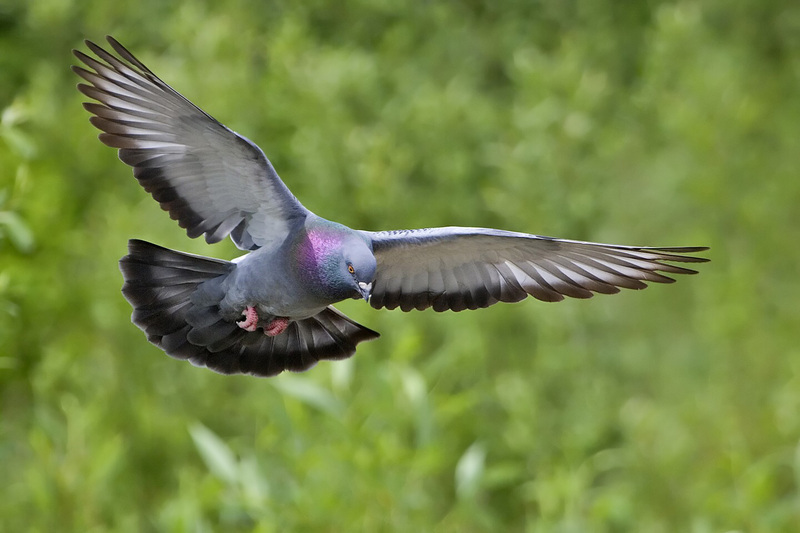 But over and above this, pigeons have a sense of smell which can rival a bloodhound. Their mental map of the world is made of odours, according to new research by an Italian team, reported in BBC Earth News in 2011. They fly over a constantly changing, subtle, dynamic smellscape. A pigeon’s SQ is out of this world. So our common, portly friends have distinguished themselves even though they are of very little brain. And they did it by doing what comes naturally: going home. But doing it efficiently, relentlessly, without exception. They have won medals and acclaim, carried vital supplies from hispital to hospital, even been employed by MI5. Going home has backfired on occasion: there’s a leg with a message on to prove it – but their dogged persistence in trying to get home: it has rendered them heroic in men’s eyes. Because they did what they were created to do. Posted in WhimsyTagged homing pigeons, pigeons, war pigeonsBookmark the permalink. I heard that they don’t expect to crack the code. What a shame that would be. I hadn’t heard, Tilly! I wonder what is so impenetrable about it? I think it might be context. Things don’t always mean the same as they did 70 years ago. appropriately in pies or breeding schemes. Oh, this is beautiful, Lou! Amazing writing! Thank you. Darwin: a piece of evolutionary trivia: the dodo was a very large member of the pigeon family. Extraordinary. Ha! Bane of your life, IE? Interesting Kate, it’ll be great to find out what it said. It would be. Though Tilly says the code is proving tough to crack. Makes one wonder why, doesn’t it? @ charlie – Haha! Or that he’ll back out of politics if they buy one of his paintings? This is the first I’ve heard of this story Kate, it’s quite sad actually. So near and yet so far. I’m not a pigeon lover myself, but I am fascinated by how they can get back home from anywhere! Oh, dear..Mac has never got near one. Far too slow. What an interesting story! I wonder if the message was very important? Interesting story, Kate. I will try not to step on the pigeons who beg for my food when I sit in the park and try to eat. They are deeply infuriating animals, aren’t they, Andra? They must crack the code, even now, lest the poor pigeon’s work would be in vain. What a true soldier this pigeon was, giving his life for country. Fascinating, Kate, about their sense of smell being so keen as to sniff their way home. I’ve seen pigeons on our finch feeder. It is a funny sight to behold. I can just imagine that pole bending to 45° – even funnier after a drink. Pigeons are pretty. It’s just that there are so many of them. I prefer them to Grackles, those huge black birds whose cry sounds like crackling cellophane paper. Cooing is a soothing sound. Some pigeons have that abalone-shell, mother-of-pearl look on the neck, like gasoline in the water. Maybe Hitler was trying to make a deal and now we’ll never know, if that’s what’s on the red canister. Maybe the pigeon was a double agent. Maybe a James Bond pigeon had a big fight with the canister pigeon in the chimney and left him there. Without the James Bond pigeon, I shudder to think what might have happened. My first husband found a young pigeon in the park when he was walking (my husband, not the pigeon) and brought him home. Named Duffy, the pigeon grew and left copious amounts of excrement all over our newspapered carpet. Pigeons can whack you on the shins with their wings if you get close, and it can smart. Duffy grew up and eventually took off with a group of pigeons who flew by our patio where Duffy was sunning himself. The carpet was never the same. Hello, Gale: thank you for your comment. I sense a kindred spirit, you describe the pigeon’s attributes so vividly! I feel it could be vital to pitch this comment to some Hollywood directors within the next few days. The pigeon-grappling-in-the-chimney action sequence has exceptional promise. Although who one might choose to cast the James Bond pigeon, I don’t know: he would have to have a magnetic charm. I shall be sure, should I ever come across a pigeon in a park, to leave it be and call the RSPCA instead. My carpet couldn’t stand the action. At least they do mostly find their way home. The other reputation, in their dove guise, is vastly overrated. According to my observations they are not peaceful creatures at all. I’ve seen them pecking the heck out of one another. The distinction between doves and pigeons isn’t a very clear one, apparently. Am just not a pigeon person for some reason. I marvel at their homing instinct just like everyone else, but they just irk me and am not sure why. Perhaps it is that they always seem so ebullient. And being over happy just seems unnatural. Some of my relatives call them airborne rats, though I think that might be taking it a little too far, Hudson. They do seem happy; but I wonder if that is just the vacancy of very little brain…. Something a bit forlorn about a pigeon bone with a red canister in tact. Now I know what I can be doing with all my old altoid tins! May we each do the same. I think so. I feel sure there is an allegory nestling there for us all. We don’t all need to be rocket scientists. We just do what we do best. I had to laugh at your portly Pigeon story Kate and agree that Pigeons are not the smartest tools in the box! We have our own numbskull that has taken to trying to extract food from a hanging feeder. Fortunately my feeders are suspended using antenna wire from wall mounted T-brackets that are designed to hold up antennas in all weathers – so there’s no danger of the feeders being brought down by a Pigeon. But this Pigeon clings to the foot stand, flapping its wings desperately to maintain balance whilst trying to pick out a seed or two. It doesn’t succeed in hanging there for long before it has to give up and fall away. The other Pigeons look on in amazement and metaphorically shake their heads at the stupidity of expending so much energy for so little reward! If you haven’t seen the cartoon film Valiant, I’d recommend it for a few belly laughs. It does highlight one thing at the end – of all the Dickin Medal’s awarded for bravery 32 have gone to Pigeons. Quite a few relate to saving ditched aircrew but there are also awards for carrying messages from agents in occupied France. 😀 Wonderful, Martin. I am a big Valiant fan- the first time we watched it we were in a house overlooking the English Channel and the White Cliffs and a buoy just like the ones in the opening scene of the film. Fell head over heels for the whole concept.And as for Ricky Gervase, well…. How very interesting.As I read this I heard a thump…. a pigeon flying into an upstairs window! nice bird imprint on the glass now. Just after the window cleaner’s been…..
How craftily you wove your story from fat pigeon to the stuff of legends. Like Pooh Bear, they might be of very small brain, but their usefulness is beyond measure. Great yarn, Kate.